Where I had Got To..
I’ve run into a bit of a problem here. I still love the idea, and I still want to finish the Nefertiti Shawl, but I’ve lost all momentum, and all sense of structure. I’m happy with all the red circles. 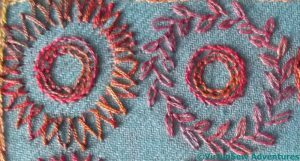 I like the colour variation and the unevenness – in real life, in a half-decent light, which winter in Britain rarely provides, there’s a vibrant, lively feel, and the use of the line stitches reflects the original pattern I used for the filling. Good. The blue section is where the trouble started. I’ve done two of them already in spite of my doubts because I’ve come across all too many instances where a piece only worked when I’d kept on through the doubts. 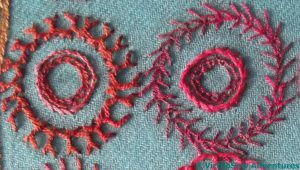 I’m not sure whether it is the yarns, the colours, or the stitches that are the problem, or even whether there is a problem at all. The pashmina is in a lovely twill weave which flows beautifully, but it’s quite fine, and a lot of the threads are thicker. But the problems of the blue section fade into nothing when I get to the green. I love the overlapping scale pattern, and I was really looking forward to stitching it. 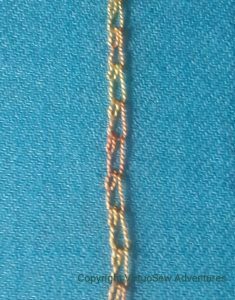 But I can’t find a pattern of stitching that works, and again, I’m not sure whether this is the colour, the thread, or the stitch. I have no idea how to sort this one out. Unless inspiration strikes, it will be some time before you see it again. The circles weren’t perfectly drawn, so the slightly wonky appearance of perspective is partly owing to that. The lighter coverage is Cretan Stitch. 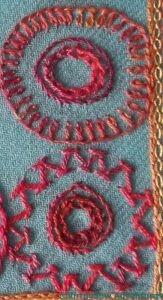 I often have trouble using cretan stitch in my more figurative projects, so I’m hoping that being reminded of it will help me to find uses for it in future. 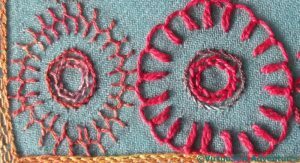 Up and Down Buttonhole stitch is an old favourite, as long term readers will know. I’ve done it more neatly, but I always enjoy stitching it. This pair was actually among the last to be finished. Italian Border Stitch can be described as a fly stitch with a French Knot instead of a straight stitch. First I did a single row, and it looked a bit thin, so I added a second layer. Much better! 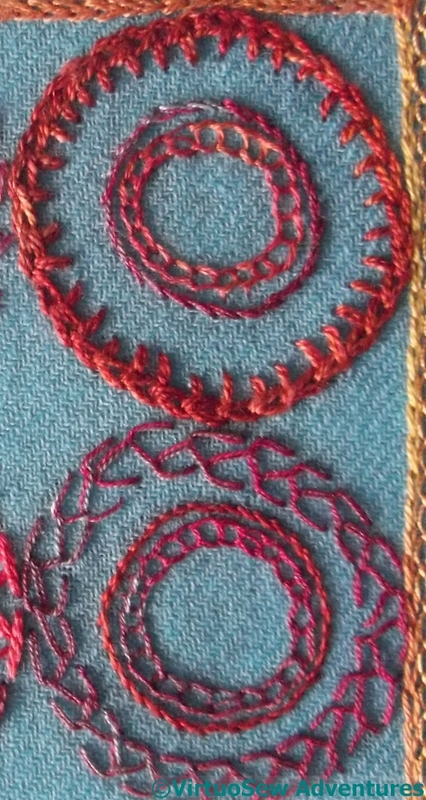 The second circle is in Chained Feather Stitch. This one curves well around the circle, and has something of the feel of a victor’s laurel wreath about it. Maybe an omen for me finally finishing the Dreams of Amarna in the next year? Once the colour scheme was sorted out, I decided that I was going to try my usual trick again. There are elements of the panel which will be the same, and other elements which will change. The combination ensures that there is interest everywhere, but rhythm and similarity to help the eye rest. 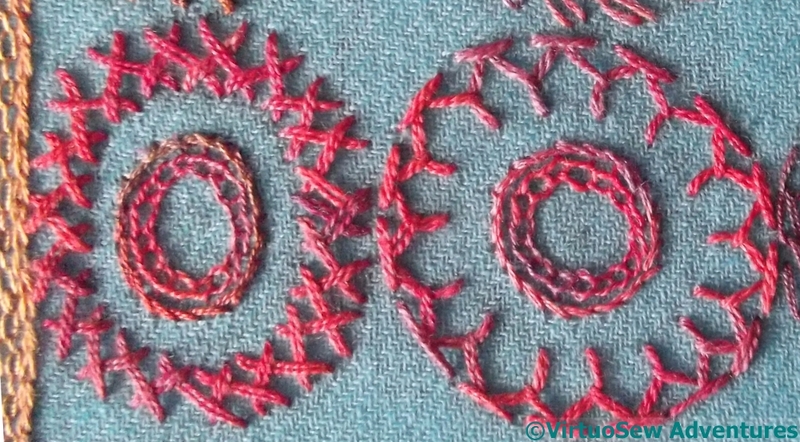 So, the two inner circles are open chain stitch for the innermost one – at about the largest scale at which open chain stitch works without decoration, which is tiny! 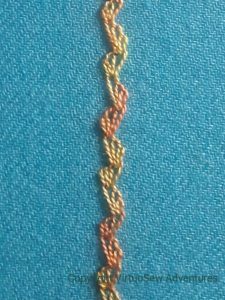 – and simple stem stitch. 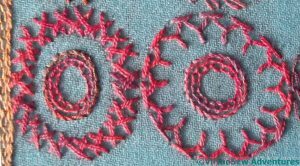 Furthermore, the open chain stitch always uses the thread used for the outermost circle, and the stem stitch counterchanges to a different weight and tone of thread. 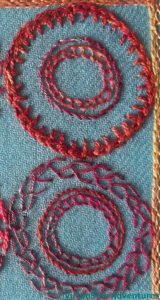 The outer circles are in Basque Stitch (top), which is another stitch with a family resemblance to chain stitch and blanket stitch, this time using two strands of stranded silk, and Chevron Stitch, in another silk perle. Chevron Stitch is an old friend, but as you see, it doesn’t run happily around curves – or at least, not curves as tight as this. The internal borders of the Nefertiti Shawl, outlining the various coloured blocks, turned out to be fairly easy, as they were part of the inspiration that struck me when I was laying out the pashmina to transfer a design to it. 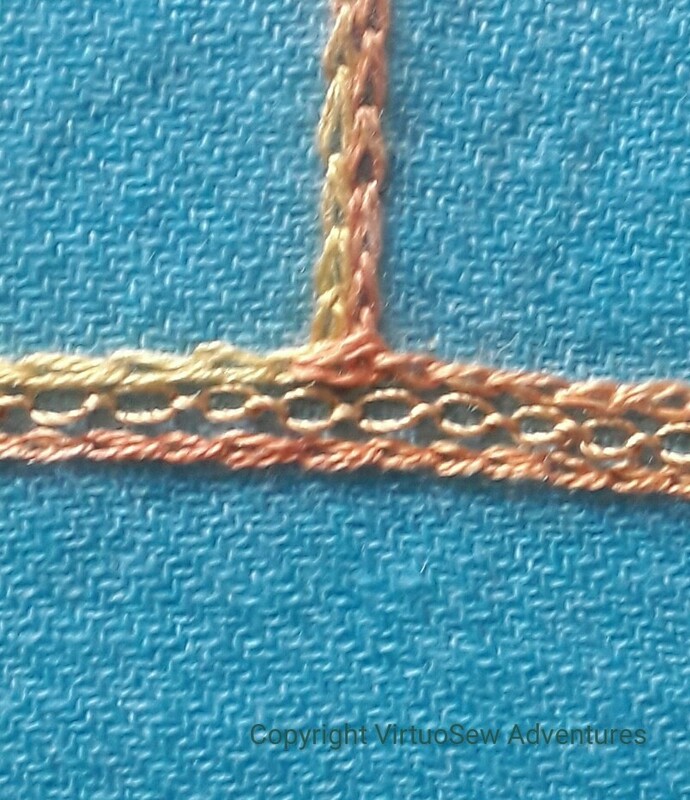 The threads are all silk, with a soft perle used for the chain stitch. 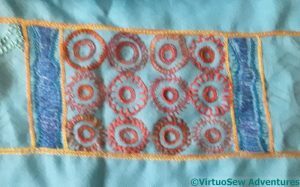 The vertical internal borders ended up as two rows of chain stitch, which should define the coloured blocks nicely. 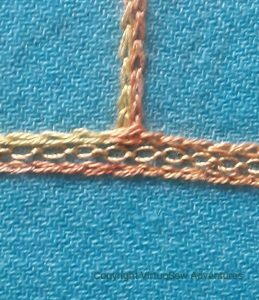 The horizontal border consisted of two rows of chain stitch, in the same variegated silk thread, bordering a single row of cable chain stitch in a much shinier silk thread, which turned out to have a mind of its own. It kept trying to tie itself in knots, it twisted into snarls, and it unwrapped itself when I tried to finish off ends. But it looks lovely! 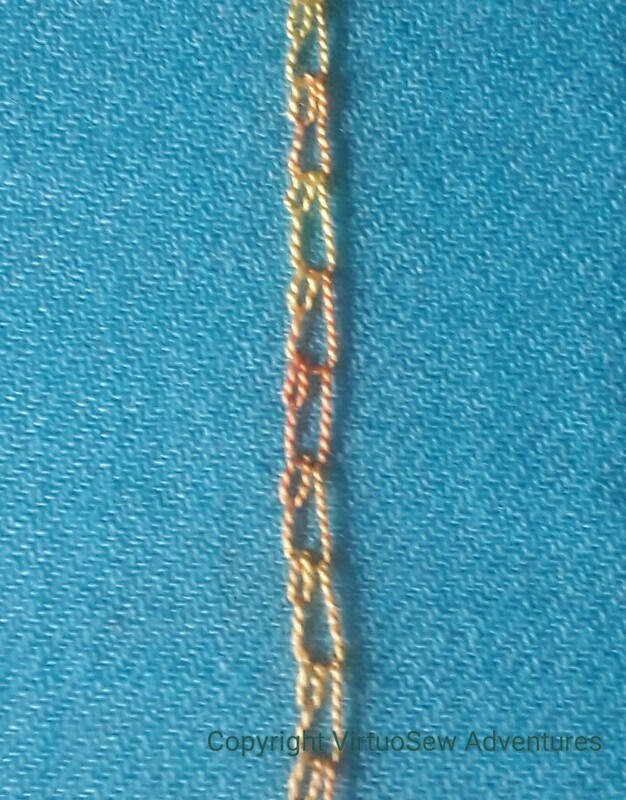 My design ideas put two lines of gold on either side of the coloured blocks that I’ve taken from Nefertiti’s crown. I didn’t want to do them the same, so I decided to make the rows nearest to the coloured blocks slightly wider. 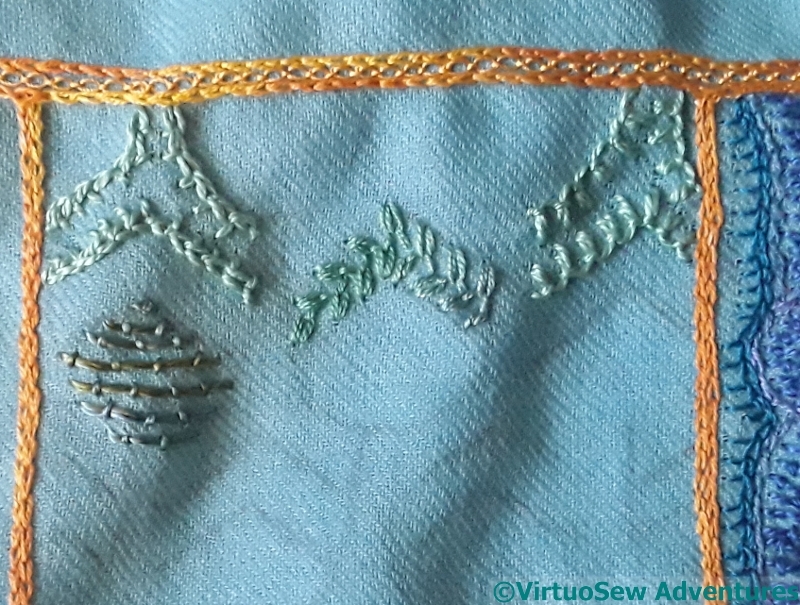 Then I had a wonderful rummage in my books of stitches and chose to take the opportunity, since the rows are straight, to use the Wavy Chain Stitch I found when I was doing the Circle Skirt and couldn’t get to curve. It works beautifully on the straight! The outer lines, I decided should be narrower. 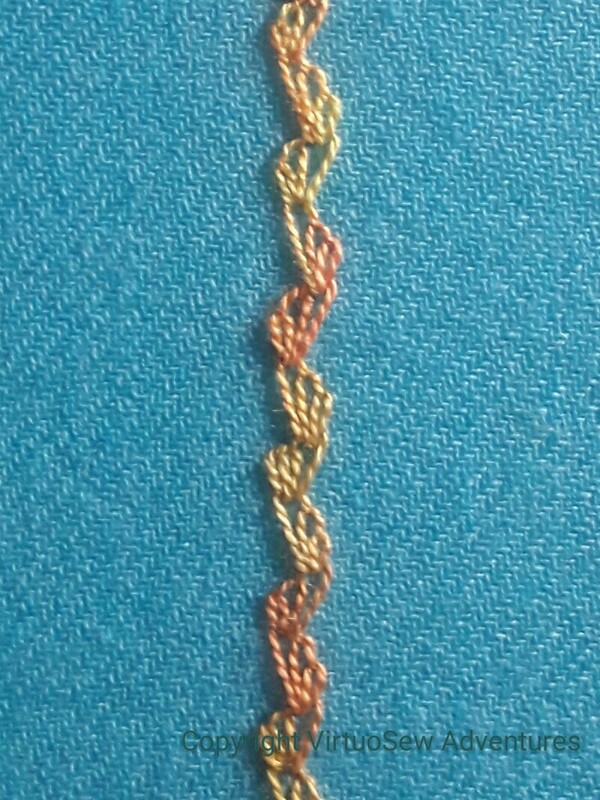 Shell Chain Stitch seemed to fit the bill perfectly. 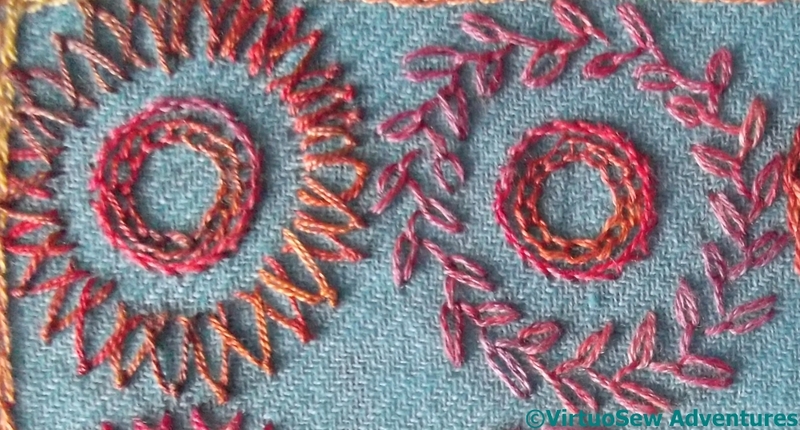 It belongs to the same family – chain stitch – but produces a light, almost textured effect.